← Grief doesn’t get any better than this. Of course Mother’s Day is a difficult day for anyone who has lost a child or lost their Mother. Like Valentine’s Day we are bombarded with adverts and this just shines a spotlight on the empty place in our lives where that person was. We can’t talk to them on the phone or send a card and we know there will be no flowers or chocolates from our son our daughter. Despite that I hope that all people so affected have been able to recall some happy memories today and have been able to feel the presence of their loved one, even though they can’t hear their voice or feel their arms hugging them. I am fortunate as I have certain people who always remember me on these difficult days and I know I will get a card and a phone call. My day started well as I connected with some parents in my online support group and connected with all the Mums I have met since losing Toby via my Facebook page. The role of social media and the web cannot be underestimated in its ability to keep us connected to others even though we may be at home alone. The weather is awful here in Cornwall so I cuddled up with Elfie on the sofa and put the fire on. She is a fair weather dog, so she is quite content to sleep and snuggle on rainy windy days. I made soup with some leeks that I picked up on a roadside makeshift stall yesterday, and it tasted so much better than if I had bought them at Tesco’s and they had transported hundred of miles from a warehouse. It is the small things that make life worthwhile. I saw and heard signs that Toby was with me. When I put my gloves on this morning for my walk a small white feather fell out, that I must have tucked in there, as I often pick them up when I am out walking. Then when I got in the car this afternoon for a short trip out I put on the car radio and Elaine Page was playing the theme tune from Toy Story, ‘You’ve got a friend in me’ by Randy Newman. Anything Toy Story is a sure sign Toby is around. My phone rang this morning and a man asked for Carol. When I told him it was a wrong number, he said ‘Sorry I was ringing my Mum Carol’, then he said ‘Happy Mother’s Day’. He would not have known how much that meant, he just assumed I was a mother, and I am. So what is my favourite Mother’s Day memory. I think it is when Toby was living in Poole in Dorset when he was doing his apprenticeship at Barclays in 2007. He sent me a card and I think this was the only time in his life when he actually bought me a card and managed to actually buy a stamp and post it to me. 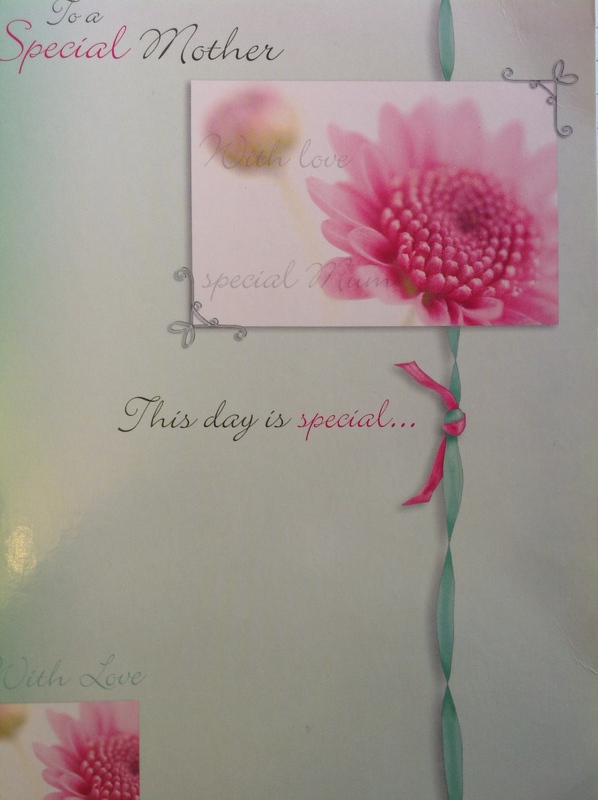 It says on the front ‘To a special Mother… This day is special and then inside it says ‘Happy Birthday’. 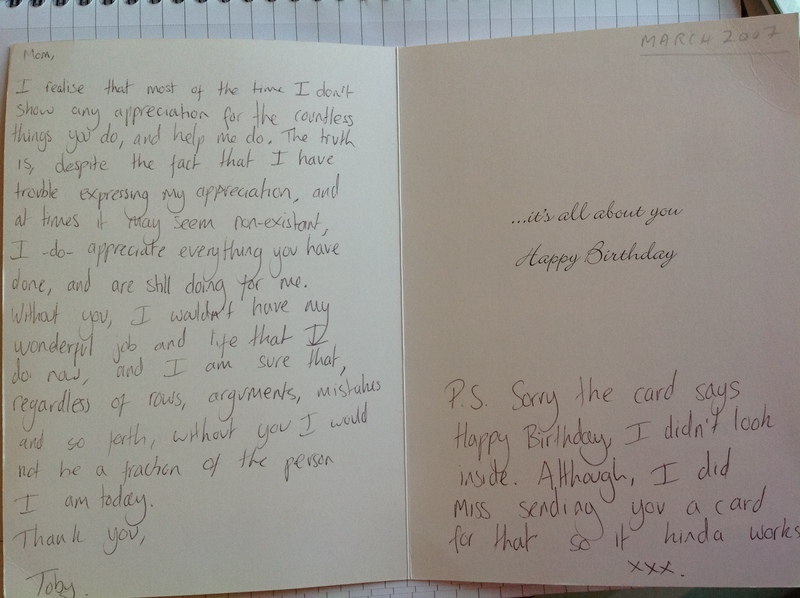 The card has a lovely message and then a P.S. This made me laugh at the time and still does today. That was Toby all over, he wasn’t always good at remembering Mother’s Day or my birthday but that didn’t matter as when I did get a card it was always so special. He always wrote a message, when he could have just signed his name. 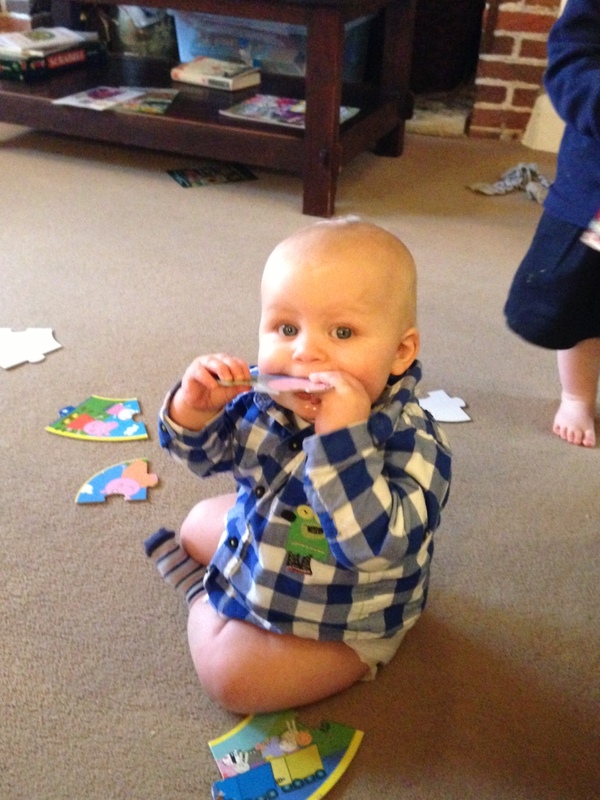 Well Mother’s Day is nearly over for another year, and I just had the best gift ever, a text message from baby Toby’s Dad wishing me a Happy Mother’s Day with a picture of baby Toby. Priceless. So I hope whatever your circumstances you have had a special day, reminded of the special bond that exists between a mother and a child, a bond that can never be broken not even by death. You are wonderful – your post made me cry. Thinking of you and Toby now. Anne, I think you are one of the most wonderful persons I have ever had the fortune of knowing. Your posts help people like me so much and today I share Toby’s sentiments. Even though I may not comment everyday to tell you how much I appreciate it, please know that your posts are invaluable, very much appreciated and a tremendous source of comfort and hope.